Excessive sweating at night can be caused by a number of health conditions, including menopause, hypoglycemia, hormone disorders, hyperhidrosis, an infection, or side effects from certain medications. Based on your medical history, a medical professional may be able to help you understand the causes of your night sweats and find a treatment plan. If cooling off your bedroom or wearing lighter sleep clothes does not decrease your excessive sweating at night, there may be other causes for your night sweats. Consult a medical professional for a thorough examination and diagnosis. Menopause. Menopause can cause many women to experience hot flashes at night. Fluctuationsin estrogen levels commonly cause night sweats. Hormone disorders. Hyperthyroidism and other hormone imbalances can lead to symptoms, including excessive sweating. Idiopathic hyperhidrosis. Some people suffer from this condition, which causes chronic, excessive sweating for no identifiable medical reason. Infections. Infections such as tuberculosis, bacterial infections, and HIV can all cause night sweats. Cancers. Excessive sweating at night can be an early sign of some cancers, including lymphoma. Additional symptoms may include weight loss and fever. Medications. Antidepressants and medicines used to lower fever, such as aspirin and acetaminophen, can lead to excessive sweating at night. Hypoglycemia. Low blood sugar can lead to excessive sweating, especially at night. Neurological conditions. Autonomic neuropathy, strokes, and posttraumatic syringomyelia are neurological conditions that can result in increased sweating at night, but are not as common as some other causes. Night sweats caused by menopausal hot flashes can be treated with hormone replacement therapy, certain homeopathic remedies, and exercise. Excessive sweating at night caused by other conditions can typically be treated by correcting hormone irregularities or adjusting medications in consultation with a medical professional. If you need fast relief for your night sweats, come see the medical professionals at FastMed Urgent Care. We are open on weekends, we have extended hours on weekdays, and you never need an appointment. 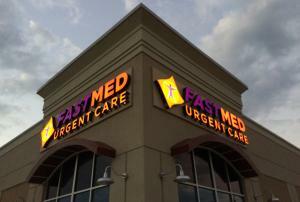 Contact us to find the location and hours of operation for your neighborhood FastMed Urgent Care.